Where to for South Africa? South African consumers are facing a tough year ahead as a number of key living costs are set to increase. This comes on top of a stagnant economy and continuing job losses. Inflation is expected to rise this year, as are interest rates. Consumers face impending price hikes for key municipal services such as electricity and water. The costs of food and fuel remain high, although the petrol price has decreased slightly. The effect of such price hikes will be a reduction in consumers’ disposable income, forcing them to stretch their budgets further, while, at the same time, seek cheaper substitutes for the goods and services they usually pay for. George Glynos, managing director at ETM Analytics, holds a slightly more upbeat view, saying the economy may turn out to be better than last year as “2018 was pretty poor”. However, he adds this caveat: The current low level of economic growth means that ordinary consumers will be forced to be more frugal. “They no longer have a choice,” says Glynos, who attributes South Africa’s difficult economic position mainly to mismanagement. The power utility has applied to the National Energy Regulator of SA for three 15% increases in power prices over the next three years. This application comes after Eskom’s reported electricity sales for the year ending March 2018, which totalled 212 190 gigawatt hours – its lowest annual electricity sales since 2003. Consumers are increasingly turning to alternative power sources – including gas, solar panels and more efficient electrical appliances – resulting in reduced demand for power from the beleaguered electricity supplier. Water rates charged by municipalities have also been rising sharply, with major metros increasing tariffs for different usage levels by between 11% and 17% last year. The prices that consumers pay for water are set largely by the nine water boards, which sell to municipalities. Like electricity, these prices are meant to reflect costs. Rand Water in Gauteng and Umgeni Water in KwaZulu-Natal make up about 70% of bulk water sales. The Rand Water tariff rose by 15% last year, while Umgeni’s two previous hikes were 14.4% to end-March 2018 and 13.2% to end-March 2019. Sedibeng Water, servicing the Free State, hiked tariffs by 8.5% last year. Municipalities add a small margin on the bulk tariff. Herman van Papendorp and Sanisha Packirisamy, economists at Momentum Investments, say that they expect consumer inflation to rise from 4.6% last year to 5.2% this year and to 5.7% next year because of currency depreciation, above-inflation wage increases and higher electricity tariffs. As a result, Momentum Investments expects an increase in the SA Reserve Bank’s key repo rate from 6.75% to 7.25% by the end of next year. In a development that will boost food costs, the price of white maize on the JSE shot up last month to its highest level since December 2016 as a result of drought fears associated with the latest maize crop. During the medium-term budget policy statement delivered in October, National Treasury made it clear that there would be minimal or no tax hikes announced in next month’s budget speech. However, a number of bankrupt or ailing state-owned enterprises (SOEs) are looking for funding from National Treasury, which means taxpayers might be called on to foot the bill – a move that could again see major tax hikes this year. 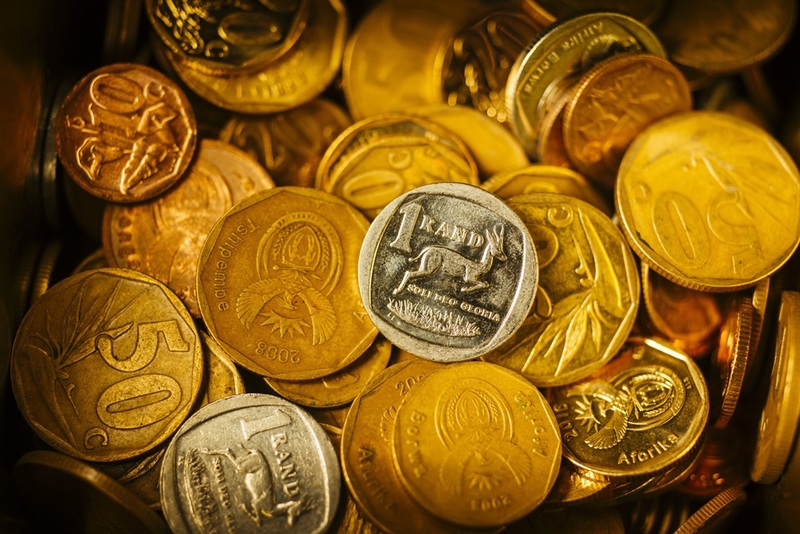 Any significant bailout of SOEs could place South Africa’s credit rating under even more pressure than it currently is, especially if ratings agency Moody’s Investors Service reacts by cutting the government’s credit rating to “junk” status. Currently, Moody’s has the country at one notch above subinvestment grade and is the only one of the three major agencies to rate South Africa above junk status. Should Moody’s concur with the two other agencies, it could be a shock for the economy and have a knock-on effect on ordinary consumers. The price of key sources of fuel – including petrol, diesel, illuminating paraffin and liquefied petroleum gas – increased sharply late last year as the international crude oil price climbed. The inland price of 93-octane unleaded petrol peaked at a record R16.85 a litre in November before dropping to R13.79 a litre this month. Despite the drop from a record high, fuel prices remain extreme when compared with their historical levels, which means transport costs will remain steep. Momentum says employment gains this year are expected to “remain constrained”, and it predicts that little progress will be made in eradicating poverty. 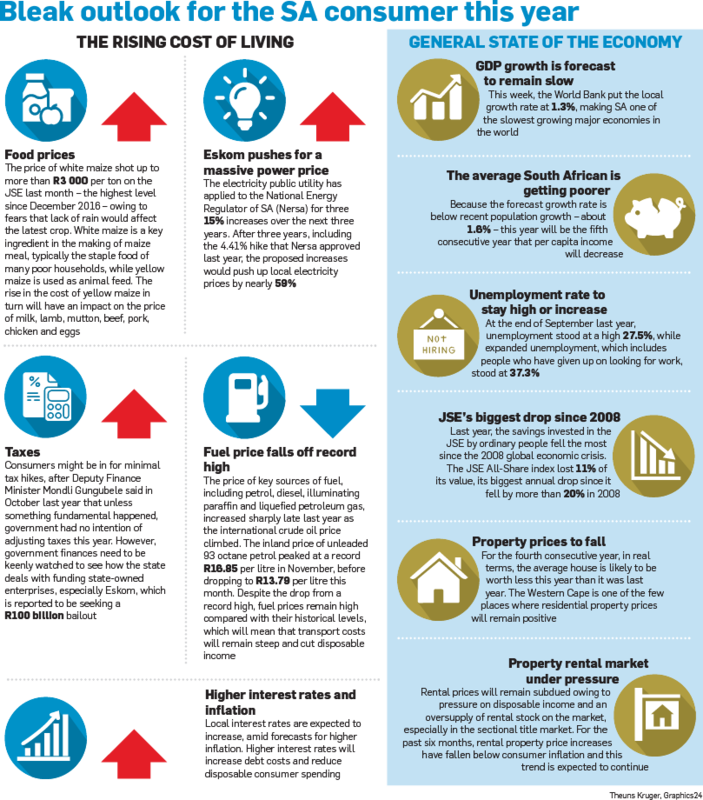 Last year, South Africa experienced its first recession – defined as two consecutive quarters of negative economic growth – since 2009, while growth for 2017 was expected to have been between 0.5% and 1%. This year, economic growth is expected to be only a little better than it was last year. 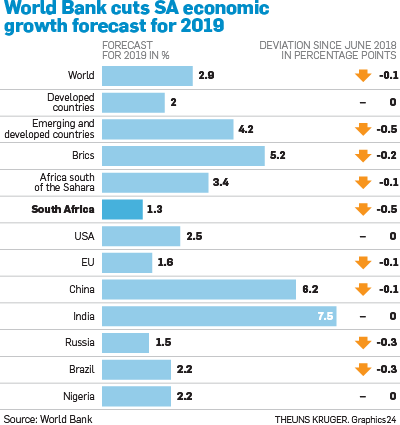 In its latest Global Economics Prospects Report, which was released this week, the World Bank slashed its forecasts for South Africa’s economic growth this year to 1.3% – down from its June 2017 forecast of 1.8%. It also reduced its forecast for next year to 1.7% and to 1.8% for 2021. In addition, Eskom’s return to implementing power cuts has put South Africa’s economic growth at risk, as Momentum Investments explains: “Research by Standard Bank noted a 5% electricity shortfall during the 2008 electricity load shedding [signalling the start of Eskom’s crisis], reducing economic growth by between 0.3% and 0.5%. This is all happening against the backdrop of a world economy that is slowing and that will ultimately affect South Africa. Also this week, the World Bank cut its forecast for world growth this year to 2.9% – down from 3%. Using the per capita income measure, South Africans on average will be poorer for the fifth consecutive year as population growth will again exceed economic growth. People whose money was invested in local shares saw the JSE all-share index lose 11% of its value last year – its biggest annual drop since the global financial crisis of 2008, when the index fell by more than 20%. Property owners are also in for a hard time as the value of residential property in real terms, after inflation is factored in, is set to drop for a fourth consecutive year – illustrating again how South Africans are getting poorer in real terms. According to FNB household and property sector strategist John Loos, residential property growth most likely increased by 3.5% last year –below consumer inflation, which was above 4% last year. This year, says Loos, the value of the average residential property will most likely increase by between 3% and 4%. The price of local residential property has been falling in real terms since 2016, he adds. Given the above-mentioned pressures on disposable income as well as the oversupply of rental stock on the market, especially in the sectional title market, the residential property rental market is set to be subdued this year. “Tenants are facing similar challenges to home owners,” says Loos, adding that, over the past six months, rental property price increases have fallen below consumer inflation. This trend is expected to continue. In September, annual rental property prices increased by 4%. On a positive note, Momentum Investments’ economists say that consumers may have passed the highest point of vulnerability as household debt, as a percentage of disposable income, has dropped to 71.3% from the 2008 peak of 85.7%. “The Reserve Bank’s Household Economic Stress Index and Unisa’s Consumer Financial Vulnerability Index pointed to an improvement in consumer vulnerability since the second quarter of 2018,” they conclude. What plans have you put in place to weather the economic storm? SMS us on 35697 using the keyword STORM and tell us what you think. Please include your name and province. SMSes cost R1.50. By participating, you agree to receive occasional marketing material.